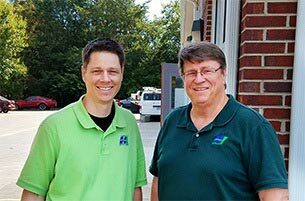 Jon and Bob Adams, a father-son duo, opened Honest-1 Auto Care Mooresville in Mooresville, NC in the fall of 2017. Jon has more than 20 years of experience in full-service auto repair while Bob has an extensive corporate background, which includes human resources and operations from the retail lumber and building materials industry. Together they are ready to provide their customers in the Mooresville area with top-quality auto repair and maintenance services, all while maintaining the highest possible level of customer service and customer satisfaction. Since he was a boy, Jon has had a knack for all things mechanical. 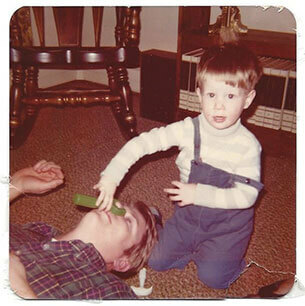 This is evident from the "rare" photo shown below where he is “wrenching” his Dad. That’s the reason why he chose Auto Repair as his profession. From there, rebuilding engines and transmissions in the family’s two-car garage became pretty routine during his teenage years. Eventually, while still in high school, Jon went on to turn real wrenches at a local repair shop, becoming an Assistant Manager and General Manager shortly thereafter. Today, Honest-1 Auto Care Mooresville offers top-quality auto repair and maintenance services to the residents of Mooresville. The tools and equipment used to diagnose and fix problems are of the latest in the automotive industry. As we grow our business, we plan to invest in servicing Hybrid vehicles as well as light and heavy-duty fleet vehicles for HVAC companies, construction companies, landscapers, utilities, and government vehicles.We are members of the Mooresville Chamber of Commerce and look forward to being of service to the community, schools, and charitable organizations such as “Toys for Tots” and “Samaritan’s Purse.” Since we provide “Eco-Friendly Auto Care,” we are also committed to participating in local environmental improvement projects within the Mooresville community. Bob and his wife Jan are members of Calvary Church in Charlotte. Honest-1 Auto Care Mooresville is the “Home of Honest Mechanics" at its core. When we do our job, we always do it with honesty and integrity, because we think, this is what customers appreciate the most. Moreover, we are committed to families by providing them with friendly and thorough services, as well as an upscale waiting room with kids' play area. From the customer areas to the restroom, we provide customers with clean and spotless facilities. We are also committed to the environment through the products we recommend, to how we clean the shop and responsibly recycle metals, paper, and liquids, making our workplace and our community a better place to live. Service by Certified Technicians on all makes and models.